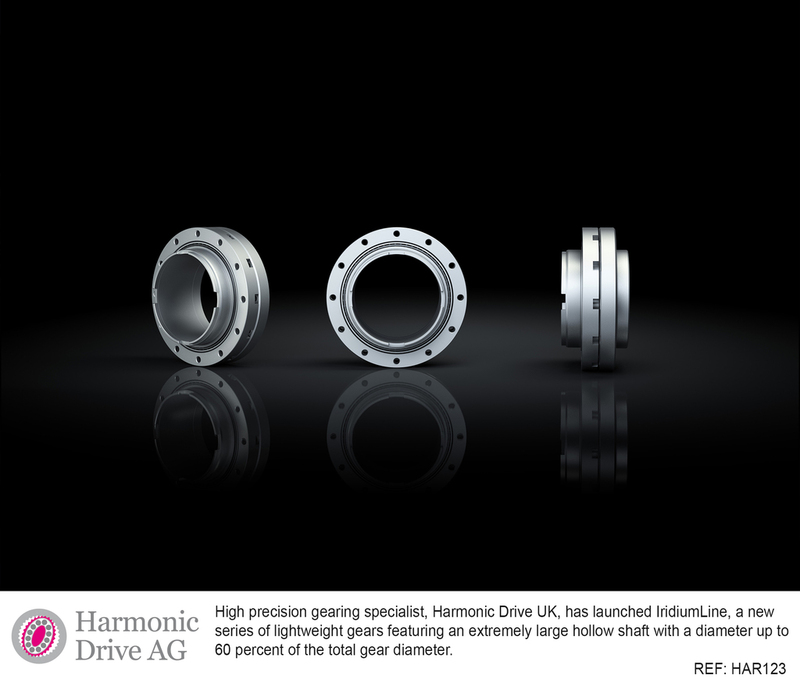 High precision gearing specialist, Harmonic Drive UK, has launched IridiumLine, a new series of lightweight gears featuring an extremely large hollow shaft with a diameter up to 60% of the total gear diameter. The new design has been achieved without restricting torque capacity, making the IridiumLine ideal for applications such as industrial, robotics, military, defence and aerospace, where the light weight and compact, high precision gear offers the ultimate integration and reliability. IridiumLine gears are available in sizes 14 to 58 with gear reductions between 30:1 and 460:1. Lengths range from 19-61mm and external diameters between 50-195mm. The series offers repeatable peak torques of up to 1300Nm with hollow shaft diameters up to 115mm. Depending on application requirements, the gear is available in two precision classes, BL3, with three angular minutes of backlash and BL1, with one angular minute of backlash. "For extreme endurance and reliability, Harmonic Drive gears consist of just three main parts; a Wave Generator, a Flexspline and a Circular Spline," explained Graham Mackrell, managing director of Harmonic Drive UK. "With the IridiumLine we were able to drastically increase the size of the hollow shaft by redesigning the wave generator to use needle bearings. "This new technology, known as WavePlus, has resulted in an incredibly compact and lightweight gear, ideal for use in robotic, aerospace and military applications that demand the ultimate in space-saving and high power output performance. The hollow shaft is ideal for passing through power cables, data lines and optical lasers." The success of the WavePlus technology means it is now being used to develop custom designed output bearing technology in line with customer requirements. A flexible manufacturing process means that Harmonic Drive can offer solutions that range from simple customer interfaces, to complete compact servo systems that incorporate custom feedback and control electronics. For extreme loads, IridiumLine gears can be lubricated with Harmonic Drive grease or oil to achieve continuous operation in extreme environments between temperatures of -50 to over 200˚C.